The case has four pieces, each of them are bezel, inner bezel, case and case back. 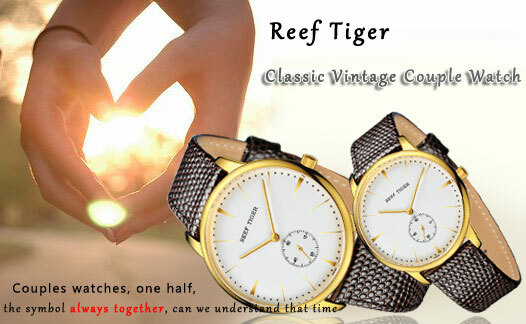 Just 8mm with so many parts, only the professional Swiss watchmaking technology of Reef Tiger can achieve. 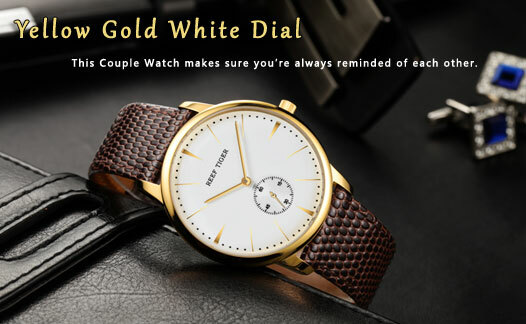 To install the case, dial, hands and crystal in such 8mm size, different from the flat sheet structure of generous watches, Vintage watches adopt bending process, first using the mold to open, then being stamped by machine. 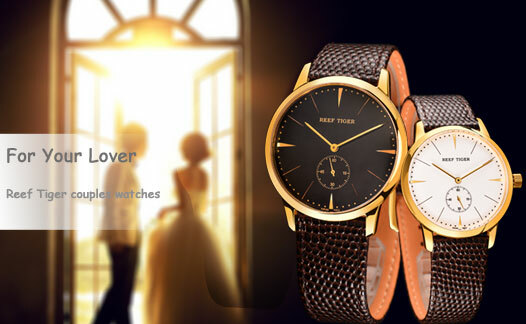 Similarly, in order to achieve the slim effect, Vintage watches adopt arched sapphire crystal glass, its material cost 2-3 times the normal sapphire, and uses anti-reflective coating to increase its clearness. In order to fit the classic retro theme of Vintage Couple watch, we use a simple pin buckle, but even a simple pink buckle, its cutting surface has reached as much as 25 faces, each side and corner are carefully polished, the spring bar that connects the buckle uses 1.8mm stainless steel material, which ensures the solidity and durability of the clasp. Unlike the luxurious crocodile leather, lizard patterned straps delivers a delicate and unique fashion attitude. The leather strap uses the first layer of imported Italian calfskin as raw material, it has soft touch feeling, perfect cutting and neatly hand stitching, bringing you the perfect wearing feeling.